Now The Details: Now Keith Olbermann Too? Something in the Management Water? Now Keith Olbermann Too? Something in the Management Water? MSNBC host Keith Olbermann has been suspended indefinitely without pay after POLITICO reported that he made three campaign contributions to Democratic candidates. MSNBC President Phil Griffin said in a statement Friday: "I became aware of Keith's political contributions late last night. Mindful of NBC News policy and standards, I have suspended him indefinitely without pay." 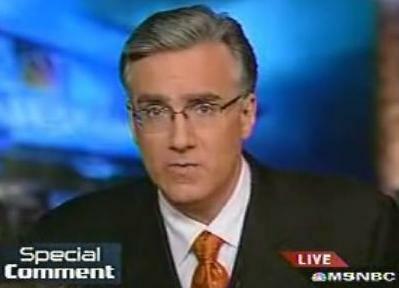 First Ric Sanchez, then Juan Williams and now Keith Olbermann. Have the media suddenly been seized with a bout of ethic guide-itis? For some on the left it will look like a case of premature capitulation when confronted with an increasingly conservative electorate. For the right, it's about time. Although NPR's removal of Juan was due to his gaffe on Fox and Ric Sanchez because of his anti-Semitic utterances, all three removals had to do with sins of omission (not staying in a reportorial role) and sins of commission (deliberately taking a partisan position on matters of public controversy). Defining your media organization as non-partisan is always a risky business these days. There are always those who are convinced that mainstream media are deliberate in their bias, even when they aren't. But CNN, NPR and NBC do consider their role to be essentially non-partisan even if they have some journalists on their staffs who aren't. Most importantly, they have their ethics guides to prove it. Removing overt partisanship from media is good, if it's followed by a re-affirmation of good journalism. So CNN, NPR and MSNBC should be applauded. One problem: leaving Fox to continue to play the anti-Obama partisan card makes the rest of the media look weak by comparison. Fox will continue to wrap itself in the mantle as defenders of free speech; the rest of the media will wrap themselves in their internal ethics guides. This may be another case where the good guys finish last. I suppose then this line of thinking begs the somewhat rhetorical question of whether or not canadian taxpayers should be supporting a "public" news broadcaster who depends on the current political stripe for its paycheque. In this economic climate it is no wonder that CBC cowtows to flavour of the day on Parliament Hill. I don't think strays too far from your intonations around the validity of FoxNews, especially since its owner is a literal cousin of the Bush family, all of them serving the Neo-Cons that still run Washington today. Another way of looking at the epidemic: money trouble. Solution: Fire everybody in sight for any reason.